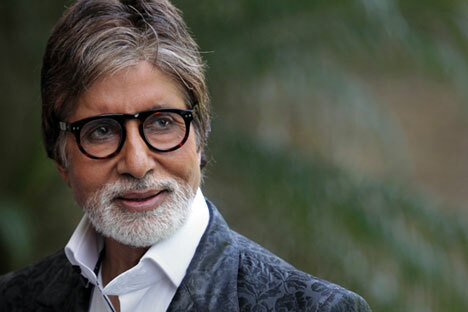 As Moscow prepares to host a festival of contemporary Indian popular cinema this week, Bollywood superstar Amitabh Bachchan spoke in an interview to RIR about his movie ‘Piku’, which is part of the festival, and his associations with Russia. Your family has strong connections with Russia (USSR). Especially your father, a poet, who translated several Russian works into Indian languages. You have been to Russia also. Do you still have the memories from that time? Memories of Russia and its people have always formed a very prominent part of my years. My Father’s association, creatively, with Russian literature and poetry in his translations, his own visits and accounts of it, as also my several trips to Russia. There is a strange but very strong affinity within me towards the country and its people, and I do long for many future trips. Is there any chance that your Russian fans would have a chance to see you soon in Moscow or any other city? Yes of course. I have made some personal trips to Moscow and St Petersburg and wish to find any excuse to be there again. Russian fans have been connecting with me over the social media every day and that is a great blessing for me. They are full of love and admiration and I respond to them each day. As you may know, "Piku"; will be shown in Russia in September. Do you think that Russians will understand it? What do you think will be the most interesting for them in this movie? ‘Piku’ is a slice of life in an average Indian home; a relationship between a Father and his daughter. Often, relationships between father and son have taken prominence, but seldom the other. It also expresses the individuality of women in our society; a society that has been plagued by gender discrimination. The daughter here in the film is independent in thought, works for a living, has her own personal life, yet looks after her somewhat edgy Father at home, apart from doing all the domestic chores that a woman normally is associated with. It looks at a possessive Father, a Father who has a frank relationship with his daughter and one that understands her needs yet is keen to build his own way of life. He has scatological health concerns, a very common ailment in most fathers, especially when they are aging, and that adds to the interest of the relationship as Father and daughter undertake a road trip to his ancestral home. It is a universal film and I am certain there shall be some likeness among most Russian viewers. Bollywood movies are not shown in Russia any more. Have you ever discussed this issue with producers? Do you see any possibility for Bollywood to make a comeback to Russia, maybe, for example, through joint projects? It is a pity that they are not shown. There was a time when they were. But then there was some trade understanding between the two countries. I do not know what the status is now. But yes it would be wonderful to bring back the Russian audiences to Indian cinema, and vice versa. I was involved in an Indo – Russian joint venture film, and it was a great joy for me to be working in such a set up. I do hope there can be many more. I am sure that you will find new fans in Russia after they get a chance to watch "Piku". Which three other movies of yours would you suggest them to watch to understand your craft better. Why? I do hope that the Russian audiences, who have always had a great affinity to Indian films right from the time of Raj Kapoor, like ‘Piku’, and I do hope that it can pave the way for future productions to find their way into your country. It would be an immense boost to the spread of this wonderful medium. Limiting my choice to just 3 films would not be just. I wish I could say all my films. I have made 180 films over 46 years and each year has had its share of my likings, so it shall be most difficult. There were several adaptations of Russian literature in Indian cinema. Have you ever read Russian literature? Is there any hero you would like to play? Yes we have been exposed to Russian literature and many Indian films have sought inspiration from Russian writers and thinkers. There are so many heroes, that it would be difficult to choose one. Pushed to a wall I would like to play a ‘common’ Russian, a man of the times, one that is ordinary, but has the will and desire to become extraordinary.